A 24-year-old man is dead after a large SUV demolished his bike at the intersection of Emma Street and Highland Avenue. According to police and witnesses one man of Valrico, was riding southbound on Highland near Emma. At that moment, another 58-year-old man rolled through a stop sign on Emma in a Ford Expedition and directly into the first man’s path. The motorcycle could not stop and the Valrico crashed into the Expedition’s driver’s side. A witness said that the victim was bleeding profusely from the head even though he was wearing a helmet. He was clinging to life when first responders rushed him to a nearby hospital, and doctors could not save him. The 58-year-old man was delivering a pizza in his private vehicle. The combination of low visibility and little protection means that motorcycle riders are over twenty-five times more likely to die in a collision than vehicle occupants. Cross-traffic motorcycle crashes, like the one in the above story, cause over a third of these fatalities in Tampa. Most people do not maintain a proper lookout for motorcyclists. Furthermore, there are a great number large SUVs and pickups on the road. So, it’s very hard to see motorcycles, especially if the driver is not really looking for them in the first place. These crashes usually involve sudden acceleration. Typically, when they make left turns against traffic, the drivers try to shoot through small gaps between vehicles. Head Injuries: Helmets reduce head injuries but they definitely do not eliminate them. Often, the impact is enough to cause brain bleeding. Sometimes, the motion alone can cause a brain injury. It’s possible to scramble the brain without breaking the skull, just like it’s possible to scramble an egg without breaking the shell. Internal Injuries: These dame forces cause internal organs to grind and bump against each other. The friction causes bleeding which is difficult to detect and even more difficult to stop. Exsanguination: Blood loss from the combination of these and other injuries is often too much to overcome. By the time a doctor can stop all the bleeding, the victim may have already gone into hypovolemic shock. 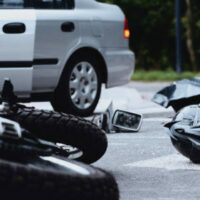 Damages in a Florida motorcycle crash case usually include compensation for both economic losses, such as medical bills, and noneconomic losses, such as pain and suffering. In wrongful death and other catastrophic injury crashes, the individual tortfeasor (negligent driver) may not have enough insurance to fully compensate the victim/plaintiff. Fortunately, there are a number of available vicarious liability theories. These legal doctrines create an additional source of recovery. Employee: The tortfeasor must be an employee. In this context, an “employee” is anyone whom the employer substantially controls. That could be a regular worker, temporary employee, independent contractor, or even an unpaid volunteer. Scope of Employment: The Tampa car crash or other negligent event must have occurred within the scope of employment. Once again, this phrase is very broadly defined. If the employee is doing anything that benefits the employer in any way, that employee is usually acting within the scope of employment. Other employer liability theories include negligent hiring and negligent entrustment. These theories usually apply in intentional tort cases, like assaults. Motorcycle crash victims have several legal options. For a free consultation with an experienced personal injury attorney in Tampa, contact The Matassini Law Firm, P.A. We do not charge upfront legal fees in negligence cases.